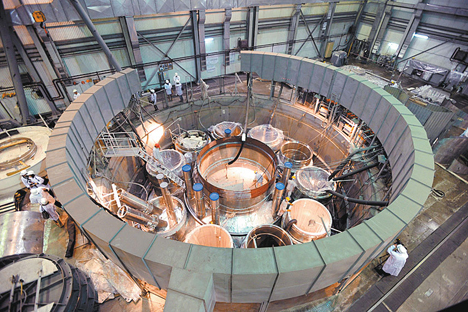 On the 60th anniversary of the first power plant, Russia is building reactors worldwide, free of sanctions. In June 1954, the Soviet Union opened the world’s first experimental atomic reactor in Obninsk, just over 60 miles from Moscow. In 1956, the UK launched the Calder Hall nuclear power plant, and the United States began operating the Vallecitos plant in 1957. These can be regarded as the first commercial electric power generating plants using atomic energy. Today, the world has 193 nuclear power plants in 30 countries. The peak of nuclear generation was reached in the early Nineties. Nuclear plants were then generating 17pc of all electricity, while in France it was more than 70pc. After the accident at Chernobyl in April 1986, Russia suspended the construction of new nuclear plants, while continuing work on research and design to improve the reliability and operating lives of existing units. But now the trend has changed, and the sector has experienced new growth. Around the world, a total of 72 units are being simultaneously constructed – on new sites and at existing nuclear power stations, including the replacement of older reactors. The most active countries in exploring this relatively new technology (for them) are China and India, while a growing interest in nuclear power generation is being shown in the developing countries of South-East Asia and the Middle and Near East. At the same time, Russian nuclear experts continue to work with their partners in the conditions of a worsening geopolitical situation. “For now, no sanctions have been imposed against Rosatom,” said Dmitry Baranov, leading expert at MC Finam Management. “The company is continuing its work on the domestic market, and in other countries. All international projects are being implemented in accordance with previously agreed schedules,” he said. The Finnish side, for instance, has already confirmed that work on the joint project of Fennovoima and Rosatom, involving the construction of the Hanhikivi-1 NPP, will continue. In addition, co-operation with China has not ceased. In late July, Rusatom Overseas and the company CNNC New Energy signed a memorandum of understanding for co-operation in a project involving the construction of floating nuclear power plants. At the same time, independent analysts regard the decision of some European countries to wind down their nuclear power generation as politically motivated. The head of the World Nuclear Association, Agneta Rising, previously stated that nuclear power must remain free from politics, as it provides secure energy supplies for people in different parts of the world. As an example, she referred to Britain, “which has been engaged in nuclear energy production longer than the others, and continues to develop”. Sergey Kiriyenko, the head of Rosatom, was even more explicit, saying that Britain was creating an attractive environment for foreign companies to build new nuclear plants in that country. “It is quite interesting logic, when they invite other manufacturers of NPPs and give them guarantees of surcharges over previously stipulated energy prices,” he explained to reporters. Mr Kiriyenko also said that there were several platforms where the British government was involved in talks and consultations with potential partners, including Rosatom. According to the head of Rosatom, it was now working on the licensing of Russian technology with Britain – pressurised water reactors. This technology has never before been used in Britain, and two years are required for licensing. This will be followed by commercial decisions being taken.